So I kept researching and reading. While doing so I had the opportunity to hear Dr. Kim Kensington of procrastinationdoctor.com do an interview during the Women’s ADHD Palooza. I can only assume that fate brought the palooza into my life as I was writing this post because I was …procrastinating. I had been procrastinating about writing about procrastinating because I was trying to avoid what I perceived as an unpleasant task. Not the writing itself, the thinking part. Luckily there are people like Dr. Kensington that are doing it for me. Thinking is painful, you know? This procrastination thing is not a new phenomenon. The ancient Greeks referred to it as akrasia – doing something against one’s better judgement. Procrastination against our own better judgment certainly makes sense because we all know that the end result of procrastination is stress, even when you do complete the odious task you have been avoiding. In the book The 7 Habits of Highly Effective People, Stephen Covey discusses the idea that human awareness, the ability to analyze our own thoughts and behaviors, is what sets us apart from other species. He is pretty much hitting the nail on the head from what I can tell. Most of us know when we are procrastinating, right? I recently read that we self-sabotage because failure is less scary for us than facing the unknown. <Via> Yikes! 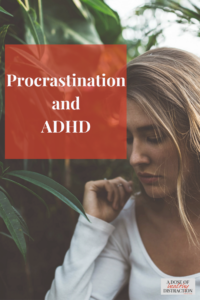 so Is procrastination related to ADHD? Umm YES. Or at least our inclination to procrastinate is heightened by our ADHD symptoms and the emotional dysregulation inherent to the condition. We with ADHD are ruled by emotion, and emotion is what causes us to procrastinate. Only you have control over your own actions. If, as Mr. Covey speculates, we make a choice to avoid unpleasant activities then we need to put the onus on ourselves to make a change. We don’t have complete control over our thoughts. Sometimes what’s going on in our heads is so intense and so tangled it is hard to focus on anything else. 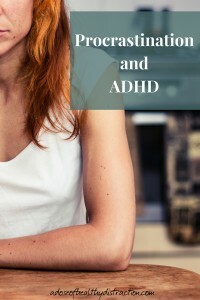 Read more about thought patterns in my post about Emotional Management with ADHD. But in order to change anything in our lives we have to to commit to doing the work. Commitment is scary, and not everyone wants to work that hard. But if you do want to make positive changes.. Personally, I have a lot of anxiety. Every time I start something that will require a lot of my mental energy I blow it up in my mind. And I don’t mean I get a little nervous. I go nuts. I spend hours overthinking and imagining all of the worst outcomes in startling detail. Before you know it I’ve convinced myself that I will fail miserably and I should just do nothing. It’s easier to do nothing than it is to try and fail. Right? In my Anxiety and Depression Workbook I have worksheets for procrastination, negative thought patterns, and avoidance. I developed them because I realized that every time I found myself procrastinating, it was because I was having an emotional reaction that was out of line with the situation. What negative thought patterns am I running about this? What am I afraid will happen when I start? What are the consequences if I don’t start? For me to complete any task I must know what steps to take and in what order to take those steps, and I need a measurable deadline. Or it will not get done. If I cannot name the first step I’ll freeze. Sound familiar? The ADHD brain doesn’t do well with ambiguity, we see things in a very black and white way. And we really don’t like uncertainty because it makes our anxiety and fear of failure worse. In life, there is constant uncertainty. So I’m sure you can see why this procrastination thing is so tough for us. And how something that should be fun – like planning a vacation – actually becomes a nightmare. Sometimes we need a kick in the pants to get out of the thought spiral. Can I choose just the first step? Who can I go to for guidance and clarity? Write it down if you have to. Notice any tension in your body as you acknowledge your feelings. Take a mindful minute. Work to uncover the emotions that are driving you to procrastinate, or avoid, or otherwise self-sabotage. You can change the way you think, but you have to get really self-aware. Learn about how your ADHD brain works, and how the executive function deficits inherent to ADHD impact your ability to get started and follow through on tasks. Wanna work with me? Schedule a session. I do my best work one-on-one.